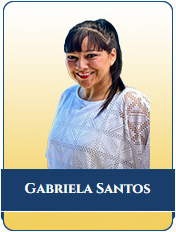 Gabriela Santos (Gaby) is a Legal Assistant/Office Manager at Adams and Corzine. She brings over 13 years of experience working at personal injury law firms. At the beginning of her career, she started at an entry level position, but advanced quickly and has worked extensively on pre-litigation cases. Gaby is bilingual in English and Spanish. At Adams & Corzine, Gaby assists with pre-litigation cases, billing and managing the office. She is excited about the opportunity to help the firm in multiple aspects, including assisting Spanish-speaking clients. Gaby is currently finishing her degree in Criminal Justice and plans on double majoring in Computer Engineering. In her spare time, she likes to spend time with her new puppy and her friends and family.